Everyone knows what a fire is. But what does fire really mean? Everyone knows what a fire is. After all, it is only one of the most fundamental forces of nature. In fact, it is so abundant and frequently-used that we take it for granted. The entire course of human history would be far different had we not unlocked the secrets of flame and achieved mastery over it. Then again, there are the times when blazes control us, rather than the other way around. What does fire really mean? Before we continue, it’s only fair that we take a closer look at this elemental phenomenon. Chemistry is the main focus here since fires result from a sudden chemical reaction. A fuel source and the presence of heat to ignite something are the other components needed to spark a reaction. What’s missing from this equation? Oxygen, as oxygen is the last component required. Did you know that fires can be friendly or unfriendly? It should go without saying, but your bonfire where you roast hot dogs and marshmallows is a far cry from a wildfire that consumes a forest. Regardless of what the situation is, fires can be broken down into numerous smaller categories. Let’s have a look. Class A: These burn everyday items such as wood, paper, and cloth. Perhaps the most common type. Class B: These burn ignitable liquids. Some examples include hydrocarbons and alcohols. Flammable gases that act as convenient firestarters belong to this category as well. Class C: This category is where you’ll find the classification for electrical fires. 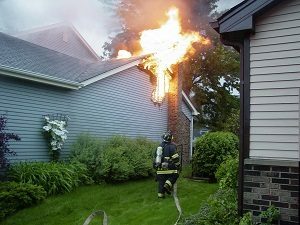 Electrical fires are also quite frequent, no matter if it’s in the home or at your place of business. If an electric current is active, it is a Class C; however, if there is no active current, it merely becomes a Class A instead. Class D: Any metals that can combust fall into this category. Some examples include potassium, sodium, aluminum, and magnesium. While they might not seem like metals at first glance – except aluminum, of course, these are all apparently types of metal. Class K: It’s only fitting that cooking oils such as animal and vegetable fats can start Class K fires. K is for kitchen, after all. This entry was posted on Friday, October 20th, 2017 at 11:55 am. Both comments and pings are currently closed.